We’re just days away from the March 26 announcement of the Huawei P30 and Huawei P30 Pro, but you probably won't be able to buy the phones on that day – the date for that might be April 5. At least, that’s what Amazon Italy seems to think, as a listing for the Huawei P30 Pro seemingly briefly appeared on that site, with that date attached. We say 'seemingly' because the page was removed before we could see it first-hand, but HDBlog reports as much. 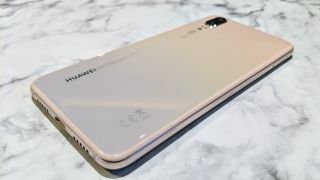 It’s likely that a retailer as big as Amazon would have an accurate on-sale date this close to launch, so April 5 may well be correct, but it’s worth noting that dates in other countries may differ, and so too might the date for the standard Huawei P30. Regardless, the listing also supposedly included a price of €1,028.19 (around $1,170 / £890 / AU$1,640) for the 128GB model. That’s roughly in line with the only other price rumor we’ve heard so far. Also included on the listing was a partial specs list, with a 4,200mAh battery, a Kirin 980 chipset and 8GB of RAM listed. The quad-lens rear camera, meanwhile, is said to include 40MP, 20MP and 8MP lenses, with a depth-sensing 'time-of-flight' lens taking up the fourth slot, and support for 10x hybrid zoom. Finally, the front camera is supposedly 32MP, all of which largely squares with what we’ve heard before. But this isn’t the only Huawei P30 Pro news today, as high-quality press renders (above) showing both it and the standard Huawei P30 have also emerged – and they were posted on Huawei’s official Belgian site, so these are the real deal. They don’t really show anything new, as the phones have been extensively leaked already, but they do give us another look at them in a range of colors. The pages they’re posted on don’t reveal much either (other than the fact that the standard P30 offers 5x hybrid zoom), but do confirm that at least in some regions you’ll be able to get a Sonos One speaker and a wireless charger thrown in if you pre-order.